Osprey Raptor Series – Solutions to Mt. Biking & Trail Running! The Osprey Raptor Series incorporates Osprey’s Hydraulic reservoir system which is designed to conform to the back’s complex shape. The result is a hydration backpack that provides a contoured fit that is both stable and comfortable for the mountain biker and trail runner. These Osprey packs have mesh pockets and organization sleeves to stow your bike tools and a magnetic sternum strap that secures your bite valve making for a hands-free release. The Raptor Series is an ideal pack to meet those demanding trail running and mountain biking adventures. New at MPGear! 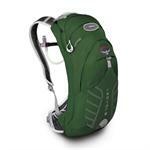 « The Osprey Manta Hydration Packs – New in the MPGear House!